If you are looking for a luthier made custom guitar, you have come to the right place! I hand build custom acoustic and electric guitars for professional musicians and living-room players who are looking for a unique instrument at a reasonable price. Whether you desire a particular sound, custom inlays, or a completely unique instrument, I encourage you to specify exactly the guitar you want or let me guide you to it. Working with musicians to design a custom guitar is something I love to do. To get some more ideas check out my Custom Guitars. Since this is your custom guitar, I want you to be involved in the process, from design to completion. I will keep you posted with photos and updates as the guitar progresses. Working with a customer in designing and building the guitar is what I enjoy most about being a custom guitar builder. Please take a look at my Youtube Channel. With my reputation for world class quality, my mission and my passion is to present your heirloom quality custom guitar that you will cherish for a lifetime. 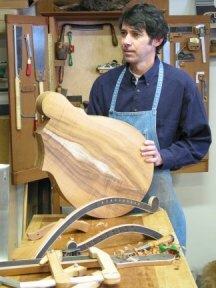 Jim Worland, custom acoustic guitar builder, holding a harp guitar that he’s working on. "Luthier-made, top-quality OM guitar for an unbeatable price. Superlative sound and playability."